The day was windy with fast moving heavy cloud, threatening rain, the light was permeating under the clouds, although there was no visible sun. I walked over the hills behind the farm and sat on a stone wall whch ran in my pictures from my point of rest to the East and North. I drew quickly each ten minutes or less (mainly due to the cold) using different media on each picture (not mixing the media because of the technicalities of the cold) I wanted to capture the wild sky, the wind, the silence and solittde and the the quiet town-the place of refuge. 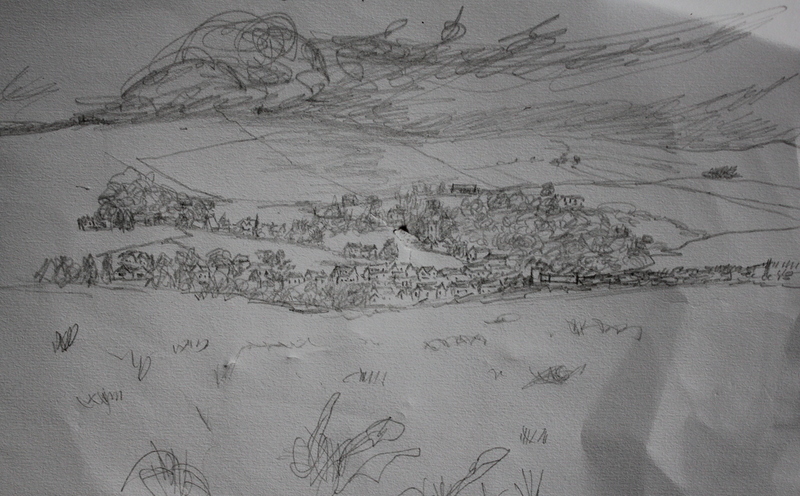 Looking west, early afternoon wild sky getting colder and windier, foreground field and trees mid ground houses of the town and back sky and hills.Drawn in black felt tip. Sky patterns wild large strokes, trees blusterry small strokes and houses solid lines -no repetition of shapes except if representing similar objects as in the trees or in the houses.The hill of Pendle peaks from the clouds in the darkest of the tones in the picture. I love the wild atmosphere of this sketch. 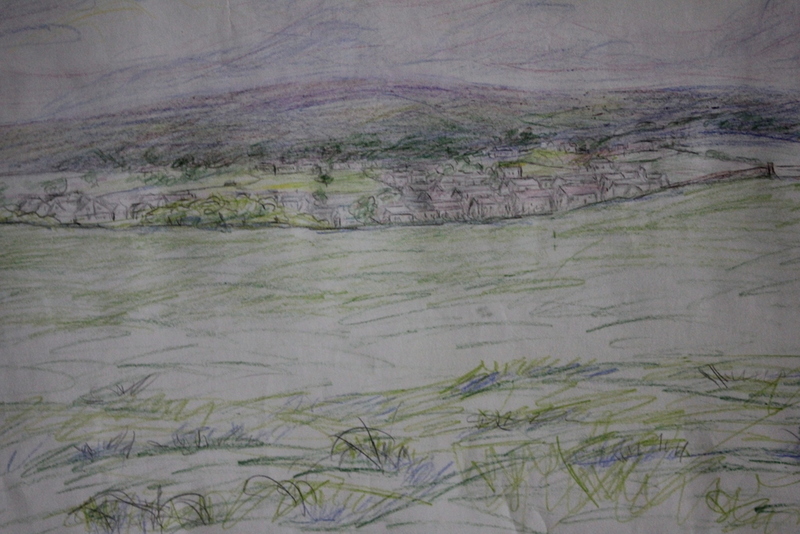 Looking South over part of town (midground) field (foreground) and sky(back ground) drawn earlier than picture above so less turbulence in the clouds. Drawn in hard pencil. Some reflection of the clouds in the grass in the foreground as regards shapes. Textures again depicted by different strokes of the drawing implement- hills in the background using less pencil pressure. I like the quaint coziness of the houses huddled together against the elements depicted by the wild sky but there were little tonal contrasts. 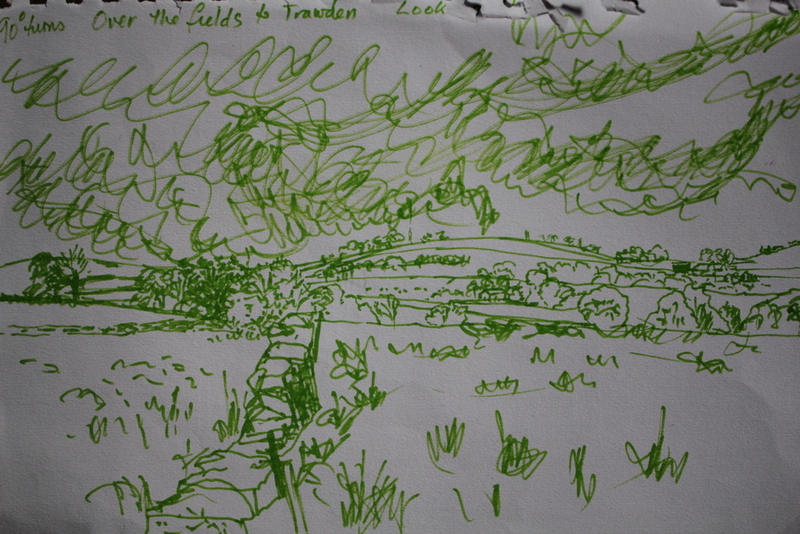 Looking North, drawn in green felt tip. The tufts of grass again reflect the lines in the clouds but are more separated than the continuous lines in the sky which sweep along with the clouds. The wall runs from foreground to midground where it gives way again to hills and farms and lines in the wall are reflected in the hills behind. The shade falls on the RHS of the wall and in the trees to the right. Looking East. This looks up the hill, the eye following the old wall with its dark tones on the right hand side. The intensity of biro pressure is greatest in the stones of the wall and in the heavy wild sky. 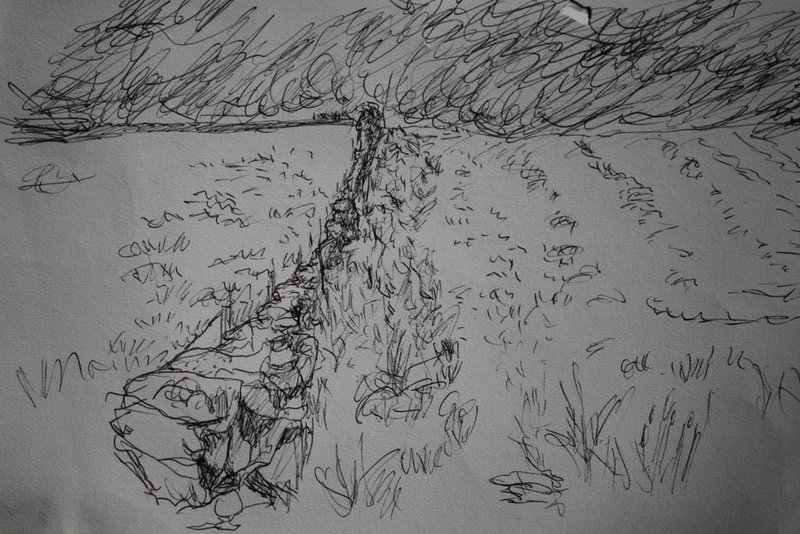 The furrows in the mid ground of the field depicted by small flicks of the biro point and the wall in fore and mid ground take the eye to the darker turbulent horizon. I think it reflects the area well. I HAD IN MIND THE PAINTING: by JOHN NASH “Earth Sky” -which I cannot find on the web but is reproduced in the OCA handbook for watercolour pg 40 which depicts in brown watercolour the furrows of a field converging on the horizon-his drawing depicts very lttle sky. Out of these four images drawn “on site” I like the first and last -the middle two are too confusing with little to mark the fore,mid and backgrounds, despite using differing pencil pressure. It proves quite difficult to depict aerial perspective with aflet tip pen or biro which do not lend themselves to lighter touch. I love the many colours in this version of the felt tip sketch above but it has become far less wild and threatening by the conversion to a more careful drawing and the incorporation of colour. The sky had additional charcoal used in it and then rubber which by accident produced effective clouds when overdrawn with white oil pastel. Looking South- in water soluble pencil, pencil and wax crayon. By virtue of the medium this drawing was very soft. 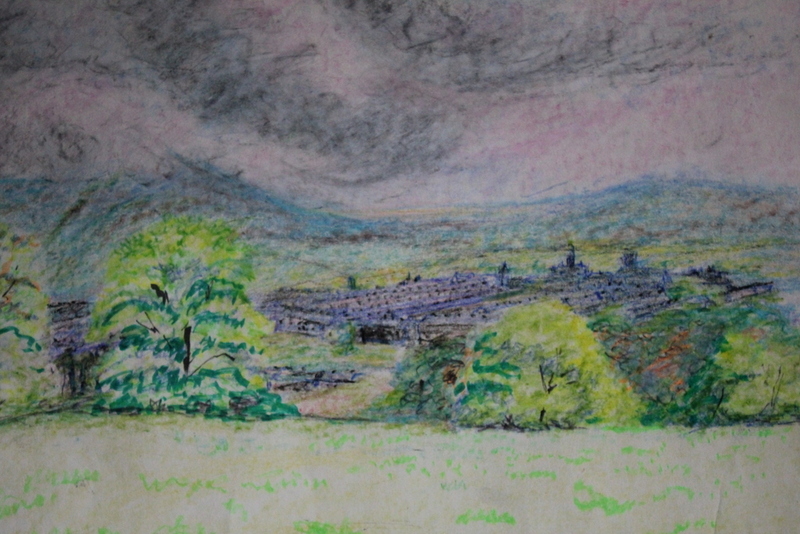 Again I love the colours which give a feeling of peace as do the light pencil marks in the sky.The eye is taken to the nestling quiet town in the midground but as the pencils are quite soft it is not easy, on the electronic version to differentiate town from line of darker hill…it is better in the real life drawing. Looking East up the hill again with JOHN NASH in mind. 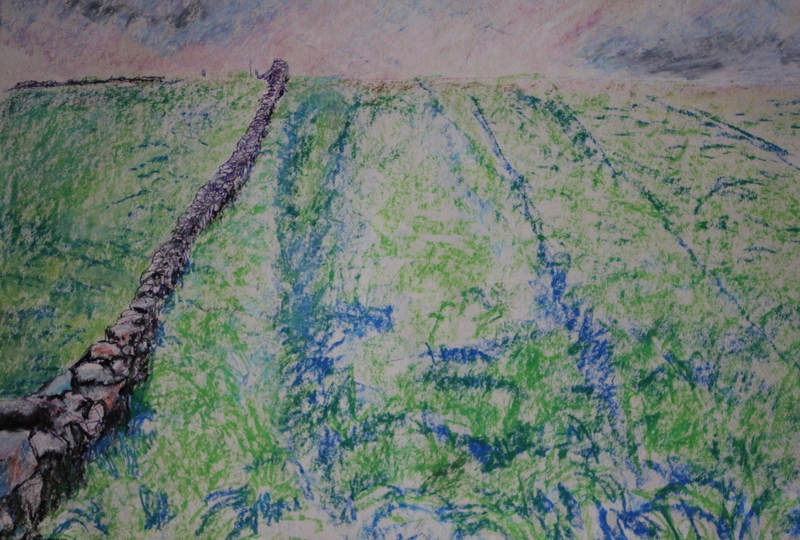 The wall in biro and black oil pastel, and the grass in the foreground both heavily drawn, fading to lighter pressured brow of the hill across the golden section. It too has lost the drama of the black and white drawing in biro and lost the angry biro marks which instilled drama into the sky and the wall which leads the eye to the dramatic sky has become too insignificant and small. how do I think/feel about this? I was cold and felt inside that I would be criticised for not achieving something that I cannot see. how well (or badly) did it go? 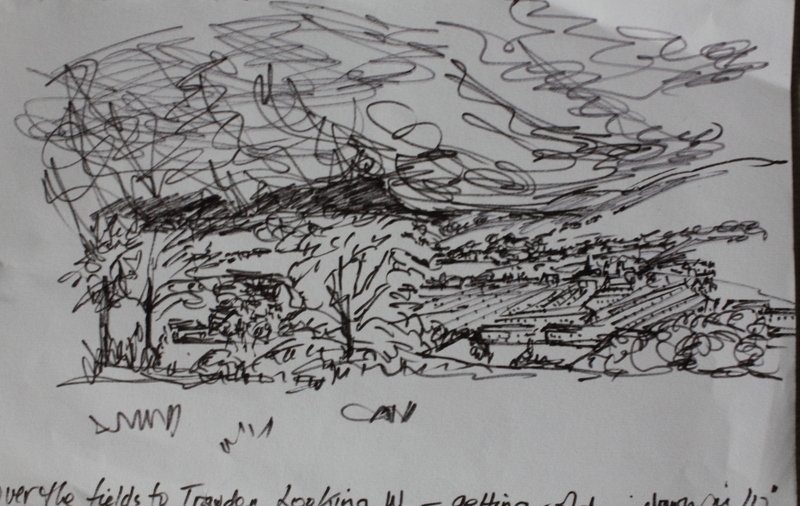 I liked the initial drawings I think I captured the wild sky and desolation. what will I do differently next time? Take a jumper. how will I do it differently next time? It would be good to redraw when the weather is not the prime worry. what have I achieved? I captured atmosphere in the environment (on sitewhich is more atmospheric than the corrupted version in the studio). how have I put any theory into practice? I have used different pressure on the drawing implement and different marks for the scene and different drawing media and I think the idea of what I saw was captured. how does what I have been doing lead to me becoming better at a skill? to choose the media and pressure to suit the picture. how can I use this to plan for the future? Practice with difffering media.